Happy Birthday Jesus Party Next Week! We started something last year called a “Happy Birthday Jesus Party.” It was a blast! We had a Birthday party for Jesus in every one of our environments. One of the things that has always bothered me is the concrete reality of who Santa is. Kids have a fresh reminder of who Santa is every trip to a store. On the other hand kids pray to a God they can’t see and learn that Christmas is about Mary, Joseph and baby Jesus but have no visual or conceptual idea of what that looks like. Last year we found having a birthday party is a great way to help kids understand that Christmas is more than gifts and Santa it’s the time we set aside to celebrate the birth of our Savior. 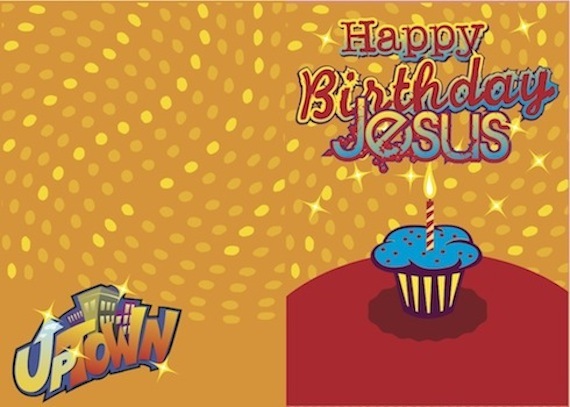 We will be hosting Happy Birthday Jesus parties in all of our environments this Saturday and Sunday December 11th and 12th at the Albany and Utica campus. You don’t need to do anything special and it won’t cost you anything. The team at Uptown just wanted you to be aware so that you can leverage this time to cement the true meaning of Christmas in the hearts and minds of your children. The service times for our Uptown envirnments.